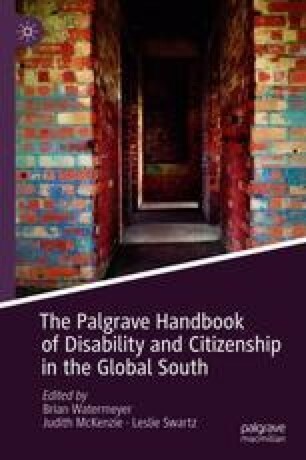 A crucial challenge for critical disability studies is developing an argument for why disabled people should inhabit our democratic, shared public sphere. The ideological and material separation of citizens into worthy and unworthy based on physiological variations imagined as immutable differences is what I call eugenic world building. It is justified by the idea that social improvement and freedom of choice require eliminating devalued human traits in the interest of reducing human suffering, increasing life quality, and building a more desirable citizenry. I outline the logic of inclusive and eugenic world building, explain the role of the ‘normate’ in eugenic logic, and provide a critical disability studies reading of the 2005 novel Never Let Me Go by Kazuo Ishiguro and its 2010 film adaptation. I argue that the ways of being in the world we think of as disabilities must be understood as the natural variations, abilities, and limitations inherent in human embodiment. When this happens, disability will be understood not as a problem to be eliminated but, rather, as a valid way of being in the world that must be accommodated through a sustaining and sustainable environment designed to afford access for a wide range of human variations. A version of this chapter was previously published in the Journal of Medical Humanities. Americans with Disabilities Act of 1990, Pub. L. No. 101-336, 104 Stat. 328. (1991). Retrieved from http://www.ada.gov/pubs/adastatute08.pdf. Accessed 27 Apr 2017. Harrison, M. J. (2005, February 25). Clone alone. The Guardian. Retrieved from http://www.guardian.co.uk/books/2005/feb/26/bookerprize2005.bookerprize. Accessed 24 June 2013. Kerr, S. (2005, April 17). ‘Never let me go’: When they were orphans. The New York Times Sunday Book Review. Retrieved from http://www.nytimes.com/2005/04/17/books/review/17KERRL.html. Accessed 13 July 2012. Menand, L. (2005, March 28). Something about Kathy: Ishiguro’s quasi-science-fiction novel. The New Yorker. Retrieved from http://www.newyorker.com/archive/2005/03/28/050328crbo_books1?currentPage=all. Accessed 13 July 2012. Shimazono, Y. (2007). The state of the international organ trade: A provisional picture based on integration of available information. Bulletin of the World Health Organization, 85(12), 901–980. Retrieved from http://www.who.int/bulletin/volumes/85/12/06-039370/en/. Accessed 27 Apr 2017. United Nations General Assembly. (2007, January 24). Convention on the rights of persons with disabilities and optional protocol. A/RES/61/106. Retrieved from https://www.un.org/development/desa/disabilities/resources/general-assembly/convention-on-the-rights-of-persons-with-disabilities-ares61106.html. Accessed 27 Apr 2017.